Resident's are you wanting to contact your favorite business, to request they move to St Ann but have no idea what to say? Below find a sample letter. The link in the letter leads to our Business Packet. Have you thought about the benefits of expanding near the St Louis International Airport? 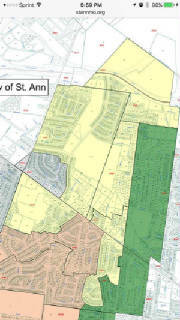 St Ann would be a great location in-between both St Charles County and St Louis City and just across the street from Lambert International Airport, located within St Louis County. With the renovation of our mall, businesses are finding it has been well worth their time and money to invest here. Starbucks opened with its strongest open on June 2017, to date it is their best performing location in St Louis after only signing a 1 year lease to start, 18 months later they are still here and running strong and Raising Canes now open 2+ years, still toting its highest volume restaurant in the region, at The Crossings at Northwest, which has been renovated to entertain 2/3 business and 1/3 retail. Even Aeneas Williams (Previous Rams Player) opened his church in the old Toys R Us building and Charter Spectrum (600ees), the St Louis County Election Board+smaller County offices (300 ees), American Family Insurance 2018 (600 ees), Save A Lot Corporate Office 2018 (450+ees), Cardinal Healthcare plus other call centers are located right here. First Watch opened in May 2018, I asked the Manager how they were doing on 7/29/18 and they are quite happy with their location. 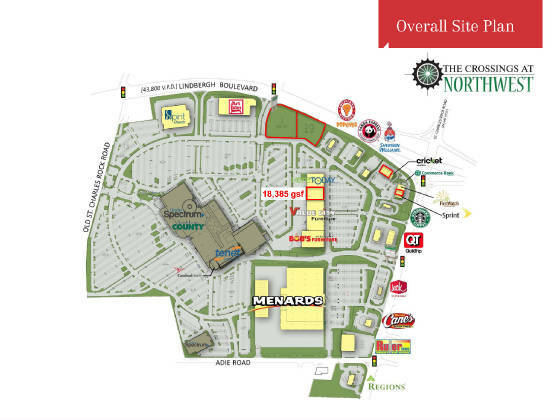 This model promotes success as the business employees tend to supply the retail/food businesses, we have found that our anchor store, Menards-attracts from a 20-mile radius. The traffic counts on our main strip, St Charles Rock Road (Mo180) are up, up, up! Just in the immediate trade area we have a pool of 50,000 to attract to your location. We have two great school districts Ritenour and Pattonville - (Pattonville is rated top 20 in the State). We have seen interest in our out lying business property’s as well, with a Dollar General, We Rock the Spectrum-Kids Gym and a Waffle House opening soon as well and an Aldi’s that opened in 2017, an Urgent Care and the Manhattan Antique Mall opened Nov. 2018. And an empty lot of some 20 years land owner has begun construction of a White Box, showing faith to attract a business to our city. Our State has recognized our increased traffic counts and between 2019-2021 have scheduled a complete renovation with ADA updates to our main strip St Charles Rock Road. A strong police force in place to ensure safety and security with a 2-minute average response time. Here in St Ann you will often see people walking for exercise or walking their dogs. Our own St Animal Pets Adoption Program, with a large group of volunteers which prides itself in maintaining our no kill shelter. Just elected as Missouri’s 4th POW-MIA city. Both of our School Districts have strong teachers doing great work and are seeing an influx of kindergartners at the start each year, requiring them to get creative in adding classrooms. Our Board of Alderman are innovative and regional thinkers ready to take on your project with an open mind and assist you through the process quickly. With the rebuild of our mall, jobs, places to eat, places to shop are on the rise again within the city and home values have gone up over the last 2 assessments. Our residents have proven over and over that they support their community recently passing a Parks Prop and a Police Prop to maintain their wonderful services. St Ann takes pride in their community. St Ann residents understand that they must keep their Businesses interests in mind as well, they refused to allow a USE Tax to be passed within our borders. St Ann also hosts Food Truck Events in our Parks for the last 5 years now. We have 9-13 Trucks in May, June, July August, October and other than a rainy day the Food Trucks are very happy with their results and typically sell out. One of your employees told me, are the best event you serve. I sincerely hope you consider our beautiful city for your future location. Our location would benefit many of possible future employees of your company with our ease of getting to for those with and without transportation due to its central location. St Ann is best described as being like living in a small town, where your neighbors will say Hi and give you a hand if you ask them, but located in a larger Suburban Area. 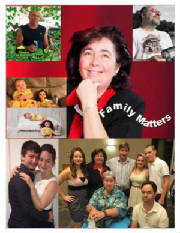 Please see the link below for our Business Packet. Please take a moment to contact Matt Conley our City Administrator 314-427-8009 Ext 1226. We can find you the necessary space for your location. There is a great spot right in between First Watch and Sprint… which is next to Starbucks. You can also contact Dave at daves@cfvatterott.com for one of the many Vatterott properties within the city. Our City Administrator can assist you with information for any of our other local developers. Paid for by Amy Poelker to Elect Amy Poelker.